This was a back-and-forth affair that wasn't decided until the very end, one of the better individual competitions of the day. As usual, the race was just a mass of humanity at the mile mark, a wall of young men stretching across most of the course and several seconds deep. In the final mile, though, the field had finally strung out up front, with William Frankenfeld (Long Beach Poly) holding a narrow individual lead. Evan Bates (West Ranch) took that from him, and then Strangio carried out the final lead change late to claim the win. With his best performance of the year, Bates finished second, with Frankenfeld third. 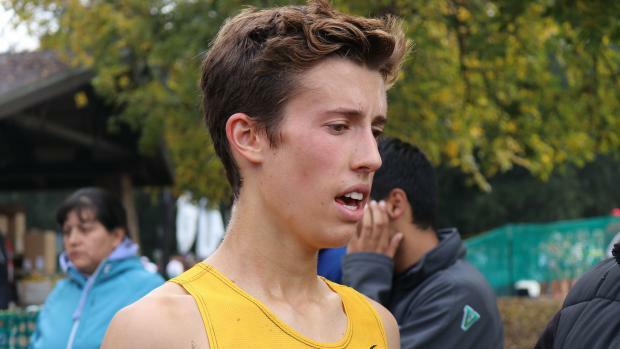 Strangio will look to improve his 15th place finish at the 2017 NXN next weekend! 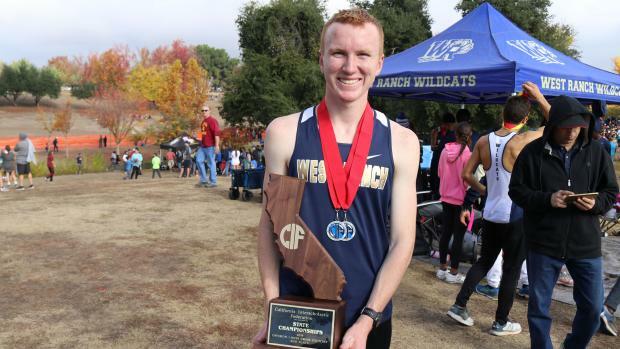 While Bates had an excellent race, you could say teammate Isaiah Seidman had the most critical performance of the day for West Ranch. Seidman finished 4th overall, helping power the Wildcats - who had lost a ton to graduation and also moved up to Division 1 just this summer - to second place overall. However, it wasn't quite enough for them to overcome Great Oak, even with the Wolfpack depleted coming into the race and then seeing a key runner struggle. The Wolfpack become the first team in Division I State Meet history to capture five consecutive titles! Sophomore Mateo Joseph was the catalyst that rallied Great Oak to the win with his fifth-place overall finish. 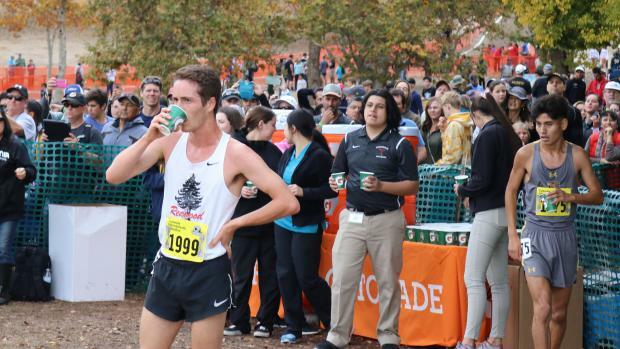 Ryan Shields also continues to be a postseason force with his tenth-place finish, propelling Great Oak to the third fastest team time in course history! 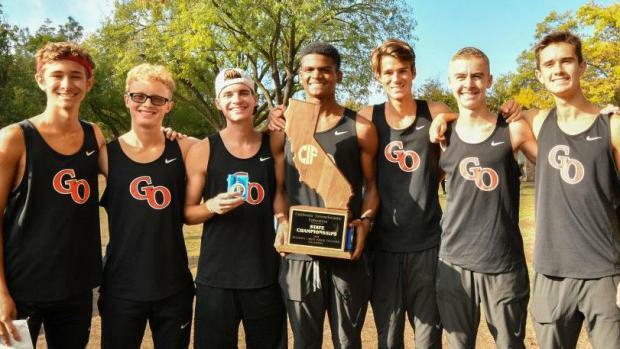 The other two squads were the 2010 Arcadia and 2015 Great Oak squads that turned around to win the NXN title a week later! After pushing the pace early and leading in team splits mid-race, Dana Hills faltered just a bit over the final mile to end up in third place. The Dolphins also lost key runners from their 2017 team, but that did not keep them from yet another podium finish! Dublin came in fourth place, just ahead of Strangio's Jesuit team, with Poly sixth and Bellarmine at seventh (all of them under 200 points). Of note: there were five non-Southern Section teams in the top ten and six in the top 12, a very strong showing for the field against the nation's most powerful single region. The early lead was held by Caleb Niednagel (La Costa Canyon), but Young took the lead mid-race and did not relinquish it, posting the second-fastest time of the day in the process. Noah Hibbard (Arroyo) was the only runner that really tried to cover Young's second-half surge, and it pulled the senior to a runner-up finish. Incredible development from Hibbard as he was 14th at his sectional finals a year ago but tied for the third fastest time at this year's State Meet! Ethan Danforth (Canyon) finished third, with Niednagel ending up 4th. Like their individual leader, Newbury Park took over the team scoring relatively early in the race and then extended from there. In what seemed an overwhelming victory turned into a slim 13 point margin by the end. Behind the Panthers ensued an intense battle for second place. La Costa Canyon came on strong late, leapfrogging past Claremont and Loyola to take the runner-up trophy. As you may have noticed, that's a lot of Southern Section teams - six in the top nine teams overall, in fact, a dominating performance. While this was arguably the most exciting team battle of the meet, it was not enough to push these squads past Great Oak and West Ranch in the results merge. 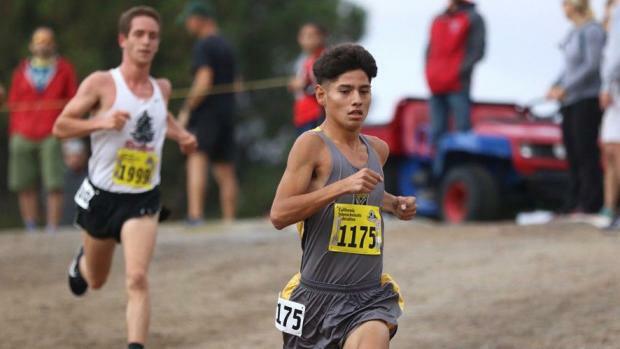 We expected Newbury Park receiving the at-large bid to NXN but were surprised that La Costa Canyon was also extended an invite as well - both head off to Portland next week! While Newbury Park returns five for the 2019 campaign, their 77:51 team time is the second best ever in Division II State Meet history. It was deja-vu all over again, as Anderson stalked the lead all race before unleashing a fierce kick in the final 800 to pull away and post the fastest time of the day. It was Kevin Ramos (Rubidoux) that set the pace, trying to pull away in the middle and opening up a five-meter lead at one point - but in the end, Anderson repeats emphatically. Ramos, the two-time Southern Section champion, finished in 15:05, well ahead of third place Brayden McLaughlin (Del Oro). 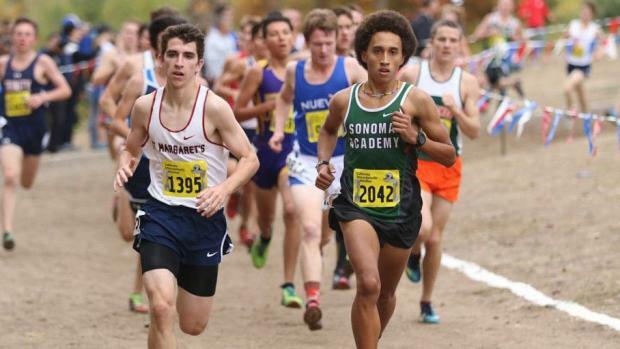 Both Anderson and Ramos return back to NXN for a second consecutive year! One of the interesting items about this race is that the individual battles up front had nothing to do with the team championship contenders. Edward Buckley (Campolindo) and Alex Cuevas (Ridgeview), who finished 8th and 9th respectively, were the top two finishers among the three top teams. In the end, it was Ridgeview's superior depth that carried the day, as their fourth and fifth scorers yielded an impressive 20 and 25 points. Campolindo ended up close behind in second place, with perennial power West Torrance pulling out another podium finish in 3rd. Indio had their strongest day of the season to finish fourth place, ahead of a tie between a struggling Palos Verdes crew and Maria Carrillo - and kudos to Chico for finishing seventh, one of the best results ever for a Northern Section team. 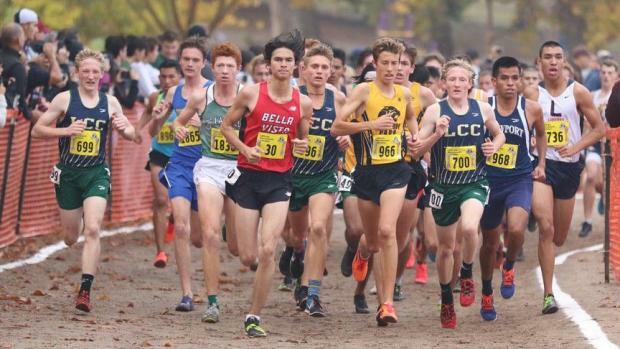 This division represents one of the strongest performances by non-Southern Section teams Saturday, with four of the top seven spots going to a Central Section team, two North Coast squads, and the Northern Section champs. On the other hand, Southern Section teams went 3-4-5 and 7-8-9, which is not shabby at all. Grover overcame a bout with the flu last week to defend his state title, pulling away from Ryan Smithers (Laguna Beach) to claim the gold medal and defend his state title from 2017. Lyle Rumon (Marin Catholic) and Henry Pick (Foothill Tech) were also close, both finishing just above 15:30. 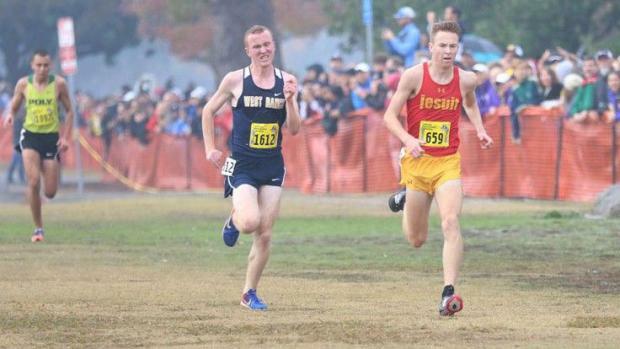 JSerra senior Peter Herold was in the lead through the 2.1-mile pass but hit the wall in the last mile as Grover surged and came up the grass to the finish unchallenged. 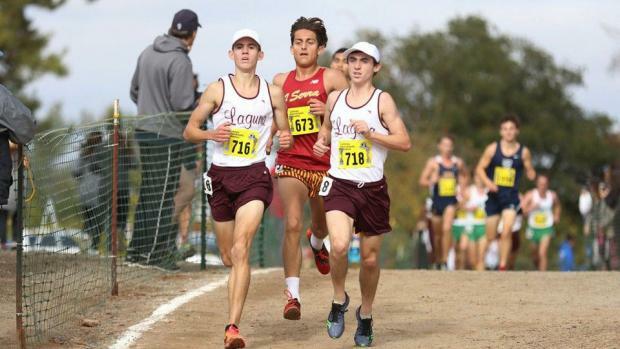 In one of the more dominant team performances of the state meet, Laguna Beach took control early in the race and held strong through the finish, scoring four runners in the top 15 points-wise. Sir Francis Drake was actually within striking range of the title through four runners, but ended the race holding off Placer for second place. 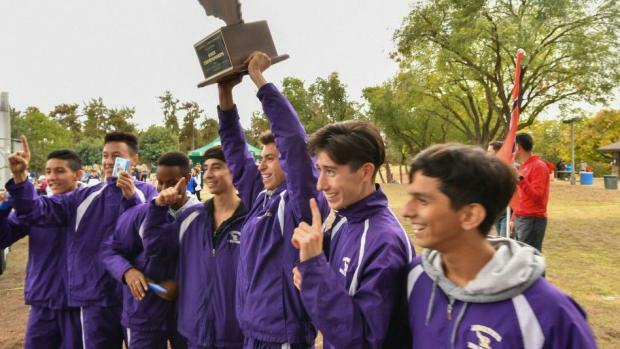 This was the weakest performance by the Southern Section of all ten races, as the powerhouse region placed four teams in the top ten (only three of the top nine). 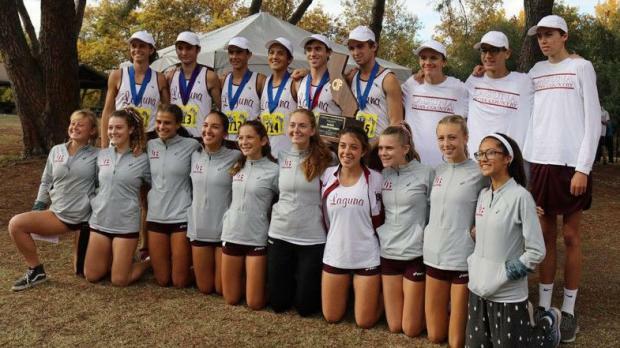 Laguna Beach had one of their top scorers struggle down the stretch which hurt their chances of breaking their own course record they established a month ago and perhaps enter into the NXN discussion. Williams has had a fantastic season, but he had to push hard all the way to the line to claim the championship Saturday over sophomore Jackson Adelman (St. Margaret's). Quite a ways back from the front two, Ethan Laubach (Desert Christian Lancaster) pulled away from the chase pack to take third. Powered by the strong race from Adelman, St. Margaret's dominated the competition - several teams in other divisions scored lower than the Tartans, but nobody won by as many points. The battle for second was INTENSE, though, with Wilmerding barely holding off Woodcrest based on superior strength up front. Rincon Valley Christian was strong enough through three runners to threaten for the top three, but as is often the case in this division depth was a factor in their final fourth-place spot. Southern Section teams claimed five of the top eight spots, but the North Coast put four squads into the top ten (and three among the first seven squads).